We will either fix your EAY60968801 power supply board for the listed fixed price or not charge you for neither time nor parts! 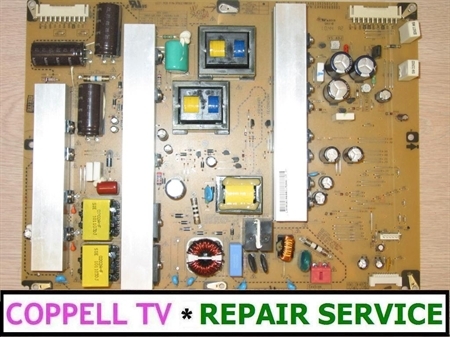 Coppell TV Repair LLC offers a REPAIR SERVICE for power supply board EAY60968801 as shown on the picture. The service targets any and all possible failures that may have developed on the board for whatever reason, subject to the board condition requirements below. We do not limit our repair services to a specific common failure requiring specific common fix such as replacing a number of capacitors or other components. Note that a DIY repair kit or an exchange service may also be available for this board. Check our eBay store and corporate web store for availability and pricing. If TV has a standby power, but refuses to power on and only clicks on and then quickly back off chanes are the power supply board is bad. If you find an open (blown) fuse on the board it is probably bad. DO not bother replacing the fuse alone, that is unlikely to help.